Signature Series II has a buttery texture and inviting aroma that make it a pleasure to apply. It goes on effortlessly and buffs to a crystal clear shine. The wax will not dry to a white chalk and will not stain trim or molding. Apply it any time of day, even in hot, humid conditions. Signature Series II will not streak or cloud. It brings out the best in any paint color. Forum member 'SON1C' with Pinnacle Signature Series II Wax on his Mustang. Super-refined Brazilian Carnauba wax, combined with modern polymers, create a diamond-like finish on today's modern finishes! 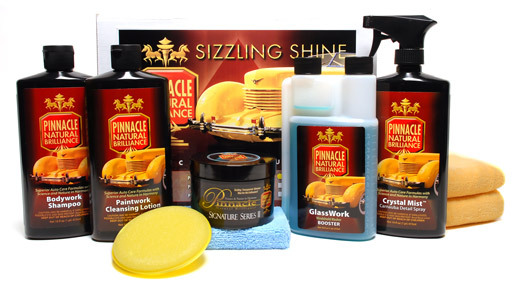 Pinnacle Signature Series II wax provides a high impact, multi-dimensional shine that enhances every nuance of your vehicle’s profile, while affording Carnauba hard – polymer tough protection to see you through any road hazard. The protective wax finish resists breakdown from assailants such as acid rain and harsh ultraviolet light. Signature Series II Wax produces a shimmering wet-look shine. The pure carnauba and natural oils found in this wax give way to a richness and depth achieved only with state-of-the-art blending technology. Count on more than 25 applications from a single 8 oz. jar! Each jar of Signature Series II Wax is hand poured. A Pinnacle Polyfoam Applicator is included. Pinnacle Bodywork Shampoo has the smooth, silky feel and aroma of a luxury body gel. As you wash, natural coconut oils attach to surface dirt. These oils act as a lubricant. Sand and abrasive grit slide off in the rinse water without scratching the surface. New Improved Formula! Bodywork Shampoo now contains Tuff Suds ®.New tecnology uses cleaners suspended in the bubble's walls to scour away tough dirt and grime.Most important, the suds last! No more flat suds water before the job is done! Natural carnauba wax gives Crystal Mist Carnauba Detail Spray its distinctive, wet-looking shine. Carnauba, combined with crystalline polymers, creates sharp reflections and silky paint. This state-of-the-art carnauba-polymer matrix also enables Crystal Mist to bond to the existing wax for an instant but long-lasting gloss. On top of ignature Series II Paste Wax, Crystal Mist reactivates the existing wax so you’re not just seeing a surface gloss – you’re seeing the depth and dimension of multiple layers of carnauba. Pinnacle GlassWork Windshield Washer Booster is an advanced additive for your windshield washer fluid. It doubles the cleaning power of regular windshield washer fluid while creating a much slicker washer fluid that is less prone to streaking and smearing. Its formula is highly concentrated which means one 16 ounce bottle of concentrate treats 16 gallons of washer fluid! It is perfect for removing built up road film, dirt and grime to avoid creating a safety hazard in inclement weather conditions. The Cobra Gold Plush Jr. Microfiber Towel is made of incredibly soft and plush microfiber in a handy 16 x 16 inch size. It's perfect for quick detailing and pampers every surface it touches. The Cobra Gold Plush Jr. Microfiber Towel measures 16 x 16 inches and features an outstanding 70/30 blend of polyester and polyamide. The microfiber’s weight is 380 g/m², making one very soft, thick towel! It's perfect for buffing. A total retail value of $186.90. Save $56.91! Pamper your car with quality microfiber towels! I have been professionally detailing cars for 10+ years and this wax is the best I have ever used. So I decided to try out some of Pinnacle's other products. They do not disappoint. They are very easy to use and do a great job.